Boom Lift Training Grande Prairie - Aerial platforms or also known as elevated work platforms are devices which enable workers to perform tasks and duties at elevated heights that will not be otherwise reachable. There are various aerial lifts available to carry out various applications under different site conditions. If operated carelessly, elevated work platforms could lead to serious injury or death. The most common causes of related accidents are electrocution, falls, tip-overs and crushed body parts. Lift operators should be trained fully in techniques to prevent accidents while operating lifts. The Aerial Lift Safety course provides required resources to help those required to learn how to operate these devices more effectively. Through the program, participants will be given thorough instruction. Types of lift covered include articulating, boom supported and scissor aerial lifts. The video presents the right techniques operators should follow. Instruction focuses on pre-operational inspection, protection against falls, stability of the device and safe driving procedures. The boom lift training course would help to address equipment reliability and employee safety, utilizing materials which are fully compliant with your local and regional regulations and requirements. Course management and training methods will be taught. The trainer will also become well versed in the technical aspects of aerial lift safety. 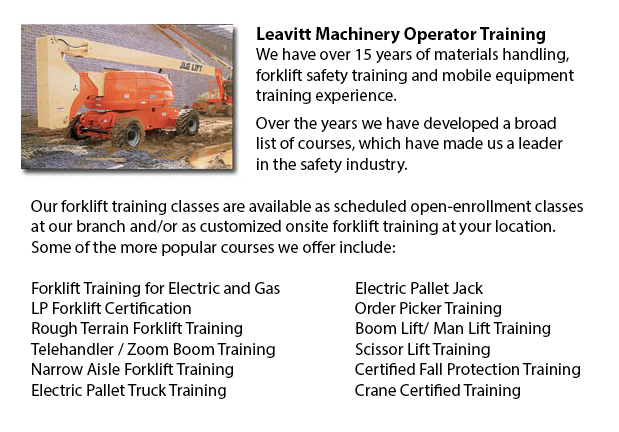 Parts of the Boom Lift Training program include both practical training and classroom training. Both sessions must be successfully finished for the participant to receive a certificate of achievement. The difference between self-propelled elevating work platforms and self-propelled boom-supported elevating work platforms is that, on the latter type, work platforms could be positioned totally beyond the base of the machine. The theoretical component of the training is nearly the same for both types. The practical component of the training can be finished sooner if only one kind of equipment is used. Aerial Platform/Boom Lift Training provides competency requirements for safely operating Boom-Type Elevating Work Platforms and Self-Propelled Elevating Work Platforms (for use on paved/slab surfaces). Training will help operators to make more efficient use of elevating work platforms whilst lessening the possibilities of a costly workplace accident. Trainees will review of applicable regulations and company polices, talk about Due Diligence, study Criminal Negligence and consequences to employers, trainers, workers and supervisors. Participants would study machine features, operating procedures, stability, parking and fueling/charging procedures. Site-specific safety concerns will be addressed.